ECOS Recycled Carpet Tiles | Suminoe Textile Co., Ltd.
Suminoe has built a system which reduces wastes and circulates resources at an unprecedented level. In response to the raising awareness of environmental issues, such as exhaustion of fossil fuels including petroleum, ever-increasing industrial wastes, and global warming caused by greenhouse gases, what can Suminoe do as a pioneer in the industry? 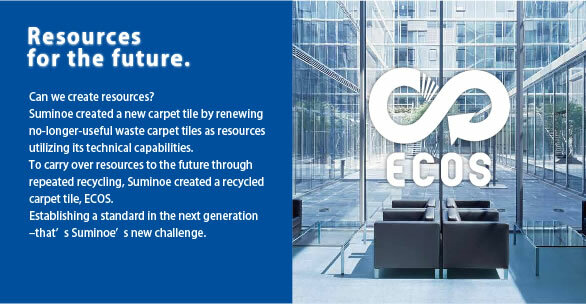 Answering to this question, Suminoe constructed the "ECOS Recycle System," which reduces wastes and circulates resources at an unprecedented level through the whole life cycle of carpet tiles. Expanding the use of recycled carpet tiles at the same cost performance level as virgin tiles in the aim of realizing a "low-carbon society" and a "recycling-oriented society"
? that’s a challenge of the first company in Japan that started production and selling of carpet tiles. ■ Achieved the world's top level recycled material ratio. The ratio of recycled materials in mostrecycled carpet tiles in the market ranges from about 25 percent to a little over 40 percent. EOCS has achieved the recycled material ratio of up to 77 percent*, far superior to existing ones. ※ In the case of SG-300 and SG-400. ■ Controlling safety with selected raw materials for recycling. There are not a few recycled materialswhose origin is unknown. ECOS only uses waste carpet tiles as the materials recycled for the backing material to secure safety by controlling the origin of materials in a visible manner. ■ Reducing substantial amount of CO2 emissions compared with existing products. The "ECOS SG" series uses Suminoe' s original polyester material SUMITRON® made from recycled PET bottles in the surface pile material. The series has reduced a higher amount of CO2 emissions than Suminoe' s existing products by 40 percent or more in the LCA assessment. The product weight was also reduced by about 5 percent, resulting in lower transportation loads. Life Cycle Assessment. Cradle-to-grave assessment of a product. It assesses environmental loads associated with a product in a comprehensive and quantitative manner through its whole life cycle, from mining of raw materials to manufacturing, transportation, use, and disposal of the product. Suminoe requested Mizuho Information & Research Institute, Inc. to conduct the LCA assessment. The company has accumulated the largest volume of data and expertise in the industry through collaboration with government offices and research institutes since the establishment of the LCA area. It also provides various solutions for supporting LCA activities to a number of leading companies, including Toyota Motor Corporation. Recycled polyester SUMITRON® made from waste PET bottles is used in the surface pile material. Renewing waste carpet tiles as resources. Suminoe has achieved the same cost performance level as virgin tiles while maintaining a high quality. Recycled polyester made from waste PET bottles manufactured at Suminoe' s group company, Suminoe Techno Co., Ltd. With high bulk and less shedding, it excels in color fastness and resistance to light, heat, stain, moisture, and chemicals, which are typical material characteristics of polyester. It is an ecological material which would be suitable for carpet tiles. Copyright© SUMINOE Textile Co., Ltd. All rights reserved.